The Haunted Curtain Of Susannah Place! A haunted curtain? I know, however if I hadn’t have witnessed it myself I would never have believed it. On a Ghost tour of Sydney’s Historic Rocks area, our guide Maxine brought us to the dark (and rather creepy) Susannah Place. Although overlooked by the bright lights of the city’s skyscrapers, Sussannah Place takes you back in time with it’s dimly lit atmosphere. Many original buildings still survive here and numerous spirits are said to still walk the cobbled streets. A young boy, murdered viciously by a street gang over a century ago still haunts the southern side of the street where it ends. 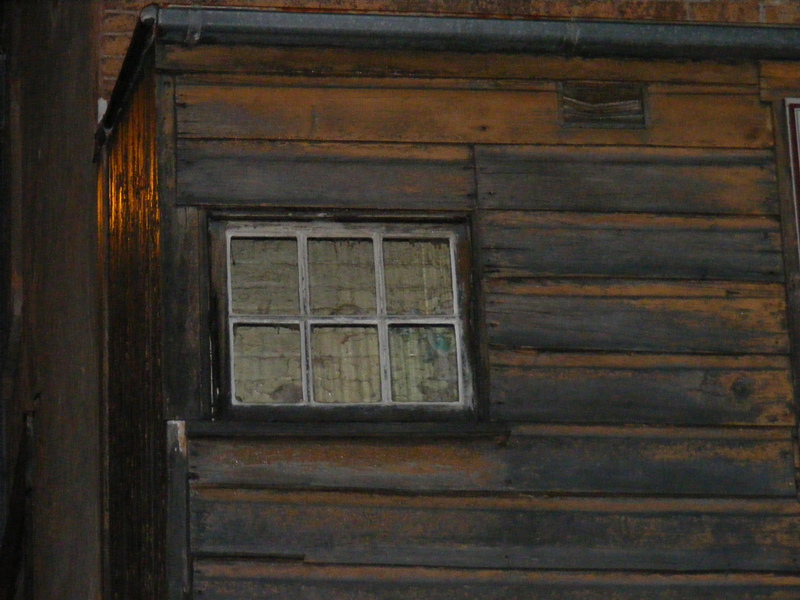 The present day museum we were told has a haunted curtain, never visible to the naked eye, yet shows up constantly in photographs. Just as we were told this, Josh (co founder & investigator of Paranormal Encounters) snapped a shot of the window which showed us the haunted curtain in it’s full glory. Fortunately, moments earlier he had taken a shot were it was obvious the curtain didn’t actually exist. A third shot showed in completely across the entirety of the window. Note the window with the red border…definately no curtain (click for the full sized image). 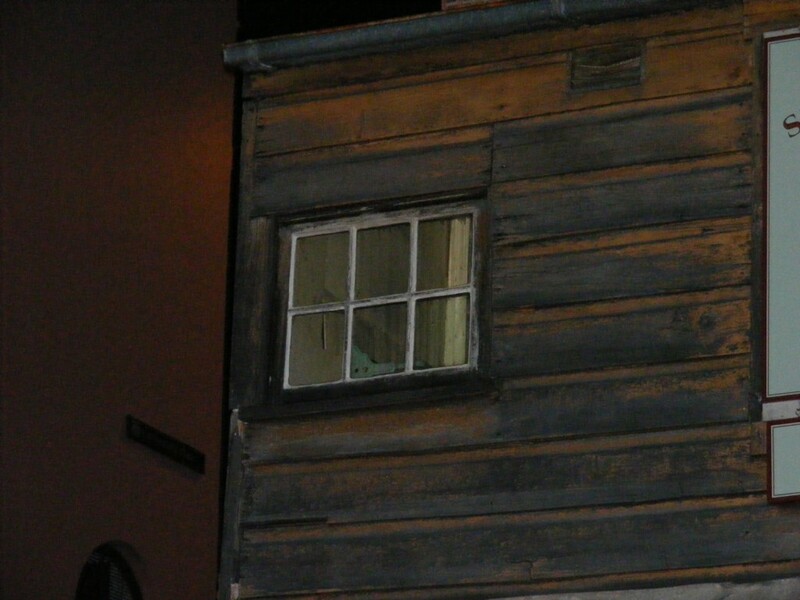 A closeup of the window with the ghostly curtain appearing on the right side (click for full image). From another angle and now the curtain is fully drawn across the window (click for full sized image). A trick of light or genuine paranormal phenomena? You be the judge, however I know where I stand on the matter. There absolutely was no curtain inside the window when looking at it in person from all angles. We were there on a dark night at approximately 9.00pm and no lights were on in the building, suggesting no one was inside. Who knew such a thing as a spectral curtain existed? Built in 1844, Susannah Place is a small terrace of four brick houses including a corners grocer’s shop, located in the heart of The Rocks, Sydney. Susannah Place has never been substantially remodelled; it has never been converted into offices or degenerated into factories or warehouses. Rare in the City of Sydney, it has a continuous history of domestic occupancy by working class families and demonstrates the ways these houses were lived in from the mid-1840s to the late 20th century. This is the heritage significance of Susannah Place. Each house is solidly built with, originally, six rooms on three levels, including a basement kitchen. Each has a fire isolation and ventilation, water supply and sewerage arrangements. These challenge popular ideas about the standards of housing in The Rocks in the mid 19th century. The intactness of the amenities in the houses and backyards records the great changes in household technology and power sources with a shift from dependence upon oil, candles, wood and coal to gas and electricity for light, cooking and heating. Susannah Place was probably connected to piped water by about 1855 and to the sewer line by about 1858. Behind the houses are original brick privies and generations of outbuildings. Early last century corrugated iron bathrooms and partly open laundries with laundry tubs and coppers were added. These amenities are some of the earliest surviving washing and sanitary arrangements remaining in the City of Sydney. There was slum housing in this part of The Rocks, and indeed in other parts of the city last century, but Susannah Place was well built and well kept and not one of the ‘plague and pestilential dwellings’. The diversity of 19th and 20th century decorative finishes, wallpapers and floorcoverings surviving in the houses tells much about the decoration and furnishing of working class interiors, and documents changes in ownership and the contributions made by individual occupants to the updating and refurbishment of their homes. Part of Gloucester Street had been formed by 1807 and, up to 1836, maps of the period record a scattering of small buildings in the area. In 1836 the site of Susannah Place was granted to James Byrne, a licensed victualler, for a yearly rent on the condition that he ‘erect a permanent dwelling-house, store or other suitable building’. Byrne died in 1838 and there is no reference to this site in his will. Susannah Place was built in 1844, probably for Edward Riley, the first owner, noted in the Sydney Council Rate Assessment Book for 1845. Comparison of houses in The Rocks in the mid 19th century, in numbers of rooms in houses and available facilities shows that Susannah Place was, comparatively, very comfortable. The annual rents in 1845 indicate that Susannah Place was in the middle of the scale of rents for that area. Edward Riley and his wife Mary arrived in Sydney in 1838 as assisted immigrants aboard the Amelia Thompson. The shipping list describes them as Irish Protestants who could both read and write. Edward, age 30, was a farm labourer from Wexford and Mary, aged 31, a nursery governess from Glenegal, County Carlow. Accompanying the Rileys was their 19 year old niece, Susannah Sterne, a milliner from Wexford. It is possible that the terrace was named for her. Little is known about the family’s early life in the colony. Given the depressed economy during this period, Edward Riley’s transition within six years from assisted immigrant to owner of four houses is intriguing. By 1846 the Rileys had taken up residence in No. 62. In 1853 Edward Riley died; his widow became the owner and lived there until her death in 1874. As owner and occupant for nearly 30 years Mary Riley provided a constant and stable presence, contrary to the more common practice in The Rocks of absentee landlords. Mary Riley left the shop and adjacent house, Numbers 62 and 64 to Susannah Sterne’s daughter, Mary Ann Finnigan. For a brief period Mary Ann and her husband John ran the grocer’s shop but by 1886 they had moved to the outer suburb of Granville and the houses were rented. Mary left the other two terreces, Numbers 58 and 60 to the Church of England, to be divided between the parishes of St Philip and Holy Trinity but the pattern of tenancy continued. Research has established the names, occupants and other biographical details of many of the tenants and their families: they were principally artisans, self-employed tradesmen, members of the maritime work force and skilled labourers living in this area near to their work. Their listed occupations included grocer, mariner, compositer, baker, shipwright, painter, policeman, and lodging house keeper. Continuing investigation of their histories will help interpret the domestic patterns of the urban working-class community in The Rocks from 1844 to 1990. Following the outbreak of bubonic plague in Sydney in 1900 the wharves and adjacent residential areas were resumed by the State Government and placed under the control of the Sydney Harbour Trust. Susannah Place was included in this resumption. The Sydney Harbour Trust was established to eradicate slum housing, to improve sanitary conditions and to direct the development of the area. The practical results were widespread demolition of sub-standard housing, the realignment of streets including Gloucester and Cambridge Streets and the construction of model tenement houses for workers, such as those next to Susannah Place. The resumption does not appear to have changed the tenancy pattern of Susannah Place: its occupants continued to be largely labourers or maritime workers – seamen, coal lumpers, stevedores, wharf labourers – and their families. In 1936 the Sydney Harbour Trust was reconstituted as the Maritime Services Board. The board continued the role of responsible landlord until 1970. With the construction of the approaches to the Sydney Harbour Bridge and, later the Cahill Expressway, many streets were blocked or destroyed and the physical character of The Rocks changed significantly. Susannah Place changed little and was well maintained. In 1970 the Sydney Cove Redevelopment Authority (SCRA) became the landlord of 25 hectares of The Rocks. Its charter was to redevelop the area with offices, shops, hotels and high and low rise housing. Strong local opposition to this scheme resulted in the formation of the Rocks Residents Group. Faced with higher rents, increased pressure from the Authority to move, and poor property maintenance, the residents enlisted the support of the NSW Builders’ Labourers’ Federation. A ‘green ban’ was imposed by the Federation on all demolition and new construction work in the area. In 1973 The Rocks Residents Group, in conjunction with a group of interested professional planners, architects and academics produced ‘The People’s Plan’ which advocated alternative developments for The Rocks, chiefly focusing on the preservation and rehabilitation of its historic buildings. A measure of compromise was reached between the Authority and the local residents and the ‘green bans’ were lifted. The tenants of Susannah Place were caught up in the battle to save The Rocks. The building had been assessed by SCRA as at the end of its economic life and occupying a site required for redevelopment. By 1976 three of the terraces had been vacated by their tenants, including one family who had lived at Susannah Place for four generations. The remaining tenants, in No. 62, assumed the roles of unofficial caretakers of the terrace. Despite their efforts to repair and maintain the houses, the lack of proper maintenance, water penetration and termite infestation resulted in major damage to the interiors and structure of the three vacant houses. With their departure in 1990, the history of the proud, respectable housekeeping of Susannah Place by its tenants had ended. In 1988, signifying a change from development to an emphasis on preserving and recycling the buildings of The Rocks and promoting its historic character, SCRA dropped the word redevelopment from its title, becoming the Sydney Cove Authority. The conservation of Susannah Place was a joint project of the Historic Houses Trust and the Sydney Cove Authority since 1987. In 1999 the Sydney Cove Authority was amalgamated into the Sydney Harbour Foreshore Authority. The deteriorated condition of the terrace necessitated urgent conservation work to the roof, the joinery, brickwork and plaster. As the significance of Susannah Place is its continuity of domestic use, the aim is to preserve as much as possible of the original structure, its alterations and modifications irrespective of the age of the work. New work is undertaken only where necessary; it is fully documented and, if possible, reversible. This focuses attention on the building’s fabric as a record of its own history, its use and adaptation to the changing needs of its occupants. Continuing research, oral history and archaeological investigation will provide further insights into the social and working life of The Rocks community through 150 years. Recognising public interest in normally hidden ‘behind the scenes’ process of conservation, the concept of a Museum in the Making gives visitors access to Susannah Place during its development as a house museum. While conservation work, research and interpretation continue, there is the opportunity to learn and participate. Visitors will be exposed to a wide range of ideas about museums and their aims through guided tours, an introductory video, recreated interiors from different periods including a working corner shop, a volunteer program for interpretation and research and the development of a range of education and community programs. We hope to foster links with the local community, to encourage its involvement with the museum and to learn from visitor’s responses in order to evaluate our interpretative programs. The tenants have included a compositor, a shipwright, a bookbinder, a packer, a seaman, a dressmaker, three labourers, two drivers, a clerk, a carpenter, a butcher, a salesman and five coal lumpers. One of these, Thomas Hughes lived here with his family from 1916 until 1929. In 1934, after living at No 52 Gloucester Street, John and Adelaide (Ada) Gallagher moved to No 58, remaining until their deaths in 1949. Their daughter Mary (Girlie) Andersen, her husband Martin and their two sons then moved No 64 to No 58. The younger son Ernie lived here until 1974. For this house there is a rich oral history from Ernie, his brother Jack, their cousin Leslie Gallagher and Thomas’ son Fred. This house is being kept ‘as found’ with only essential repairs being made. It will remain as an archive for conservation, research and teaching purposes. No 60, like No 58 was always tenanted with the landlord changing from the Rileys (1844-1874) to the Church of England (1874-1900), then to the Sydney Harbour Trust (1900-1937), the Maritime Services Board (1937-1970), and finally the Sydney Cove Authority. The tenants in the 19th century included a mariner, a painter, a baker and a policeman. In 1865 William Merchant ran it as a lodging house. Mostly the tenants’ occupation reflected the maritime nature of The Rocks: seaman and coal lumpers. Anne Poynter lived here from 1919 until c1924. Showing the changing nature of Australia’s population, the Sarantides and Passaris families briefly rented the house. The downstairs kitchen has been refurbished to this period based on Mrs Sarantides’ grandchildren’s recollections. Esther Moran and her son Stanley, an ironworker and labourer, moved in in 1953, remaining until the late 1960s. From then it remained untenanted. The front rooms downstairs and upstairs retain most of their original detailing and have been refurbished as a parlour and bedroom of the1840s. The Rileys who probably built Susannah Place in 1844, lived in No 62. After Edward Riley’s death his widow became the owner and remained here until her death in 1874. The house then passed to her great niece, Mary Ann Finnigan who rented it out. John White, a stevedore, lived here from 1883 until 1888 then Alfred Miller operated No 62 as a boarding house until 1893. In 1909 Arthur and Elizabeth Smith moved in and the Smith family lived here until 1931. Most of the male occupants during this period were labourers and coal lumpers; among the females were a machinist and a bookbinder. From 1934 until 1966 members of the Thompson family occupied No 62. James Thompson was a seaman and Albert Thompson an upholsterer. The last tenants were Ellen and Dennis Marshall who had lived in Gloucester Street since 1956. They moved in in 1962 and stayed until 1990 as unofficial caretakers and protectors of the whole terrace. This house is currently occupied by a caretaker. No 64 operated as a corner general grocer’s store from 1845 until about 1930. Among the shopkeepers were Mary Ann and John Finnigan (1876-1877) who inherited No’s 62 and 64 from Mary Ann’s great aunt, Mary Riley. Peter Stewart was grocer during the slum clearances of the 1900s and his sign features in the earliest photographs of the shop. Hugo Ljunggren or Youngein and his wife Clara operated the shop from 1903, Hugo staying on until 1930. Hugo’s son Jim Young has left a vivid account of growing up at No 64. In the 1940s the Maritime Services Board let No 64 to Arnt Andersen and his wife Mary (Girlie) (nee Gallagher). In 1949 following her parents’ deaths, Girlie and Arnt and their sons Jack and Ernie moved to No 58. The last tenant Ron Smith moved out in 1976 and No 64 became derelict. Its recreation as a shop of the early 20th century is based partly on Mr Young’s reminiscences and partly on the evidence surviving of shelves and fittings. 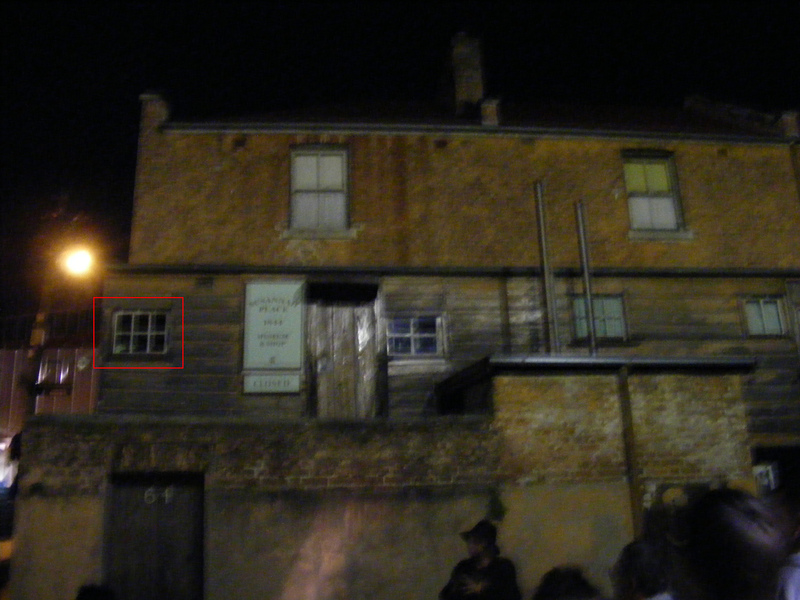 I also went on this ghost tour and I have a picture of the other side of Susannah place and there is a face in the window in my photo, looks like the face of a man with a top hat on. I then went back I few weeks later to take more pictures and again a face in the same window but different face or same face in different pose hard to tell. Does anyone else have photos with a face in the window at Susannah place? Thanks for sharing, and yes, I do believe! The Rocks is a great place to explore, in fact I was there just last week staying at the Shangri La Hotel looking right down onto Susannah Place. The pics you’re talking about certainly are unexplainable. There’s definitely something paranormal there. The images we took were from a Rocks Ghost Tour a few years ago and when we were behind the building and they were explaining the strange phenomenon people experience with the curtains at the rear of the museum, the very same thing showed up in our images. Strange place, yet so fascinating. Again, thanks for sharing, most appreciated! Thankyou for acknowledging..I have emailed plenty of sites and none even get back to me…..I can’t explain any of them.. I’m glad I’m not crazy now.. LMFAO…. Having experienced strange phenomena there myself, I have no doubt about your photos and your experiences. There is definitely something paranormal at Susannah Place that’s regularly caught on film. My only surprise that it’s not more well known in the paranormal world considering the vast amount of evidence gathered from there over the years. Thanks again for sharing your link Samantha…even the non ghostly images were fascinating!